Flying through the smog at 160 km/h on the train to Beijing… The enslaved landscape is a green blur, interspersed with cityscapes of apocalyptic proportions. Concrete factories, cooling towers, apartment block construction and destruction all flashing by in the murk. Yet there is hope, a landscape of wooded hillocks with a forest of the biggest wind generators I have ever seen. Now rice fields in drained wetlands…a quarried mountain to our right, brick houses, one man in a field hoeing, a red flag, a chimney belching smoke, new trees. A horse and cart trots down a lane…whilst another one is pulling a plough …really? The train just accelerated to 215 km/h, the gloom closes in again. The surrounding sound of the Chinese chatter a mysterious melee of contentment and camaraderie. We share biscuits. Yesterday is fast fading after 3 hours sleep and our early hotel departure. I am traveling with some fellow artists…Barry from the Northern Marianas, the St Lucian couple and the Barbados/Grenadian couple. All island people fleeing one mega Chinese city for another! My fireball mission being accomplished to positive and provocative effect, had allowed those few hours sleep to be deep and meaningful. It had been a hard days work, with a very satisfying finale. The morning was spent finishing the faux bronze paint job on the ‘Power of Nature’ spiral. This is a fiberglass version of what will eventually be cast in bronze, that will be put on display at the sculpture park for the closing ceremony. I enjoyed the painting process, stippling the paint into my mechanically textured surface, the dry brushing a metallic paint over the irregular surface to imitate polished bronze. I wished I had more time to master the process, but my ball was calling me to be packed. Full Moon! Fireball packing…..I can’t even get away from that chore here! I have been anticipating the moment and have spotted a worthy stash of chopped branches behind one of the metal work sheds. A good base but not enough, so Sunshine and I have been secreting away little stashes of wood from the plaster casters. They like to recycle their struts that are used to back the plaster mold sections. We had been making little piles over the past couple of days and took them down by the ball. Earlier in the morning there had been a second attempt at raising the ball from it’s position, laying down in the yard. Mr Wong had insisted we weld a stand onto the bottom which unfortunately had to fit a pre-cast slab, so could not be the cone shape that I had imagined. Ten workers had tried to push it up the day before: today I arrived to find them trying to pulling it up with ropes. The physics wasn’t on their side. The crane for the stone sculptors had been away for a couple of days, but as we struggled I spotted it coming back in the yard. Of course he was agreeable, after lunch. Myself, Tiiu, from Estonia, Shepherd from Zimbabwe and the Egyptian sculptor Salah had a great lunch together at the University canteen. The other artists had gone back to the hotel and were being taken by the committee to (another) park for the afternoon. They are struggling to entertain restless artists who have finished their work. At this point I am requested to meet with one of the directors, an attractive woman, with uneasy eyes, (her name I can’t recall) who is based at the hotel and looks over daily symposium affairs. She can’t speak any English. So 7 and I meet her after lunch. She wants to know the plan. 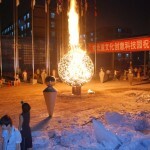 So I tell her…to burn the ball and have a party at the work site for all the workers, artists and their interpreters. The response is appreciative and seemingly positive but not clear….she has to go back to her fellows. The next night 7 has dinner with the committee and later comes back to me with the good news that they have agreed to have the party and will provide drinks and buffet dinner and we can burn the ball….”you are lucky , they are doing this just for you”. Good work 7. That night my Romanian friend, Bogdan and I, knock up an invitation on his photoshop. The next morning Sunshine and I print out 150 cards at the print shop by the work site. The party is on. The invites go out and word spreads fast to positive effect. 7.00 on the 13th at the worksite. I then rushed back to the hotel to change for the early dinner at the lake hotel. This was an easy affair with beer and Chinese wine and an abundant buffet, complete with split duck-heads and roasted oysters. The entertainment peaked early, after a star performance of Sri Lankan singing by one of our sculptors ….it took a nose dive when a young interpreter started to sing Elvis songs. Agent 7 gave me the nod to take the mike and start the next party by directing everyone to the waiting buses. They had been intended to drive people back to the hotel….but popular demand came into play and all buses were directed by the people to the Fire Ball! The bus ride was great ….aside from the inspirited Latino crowd on mine, there were exciting activities on the streets…as if part of my cunning plan. The full moon in August is a special night called Gui jie, basically translated as the opening of the gates of hell, Chinese Halloween! This is when the spirits of the dead are supposed to come out….and in order to placate them one is obliged to burn paper money at the crossroads. So all along our route were crowds of people burning paper money. A perfect pre-performance warm up! Things moved pretty quickly at the site. The workers, stone and steel, were all well cleaned up and had been waiting for our arrival. They had prepped some torches and had kerosene at the ready. After a brief word of thanks, four lady sculptors from Estonia, San Moreno, Hong Kong and India all took the honor of lighting the ball, with “gold-leafed” paper money. It took a while to catch, but eventually did to good effect. The crowd tempo grew with the fire and before long the roar of the fire was drowned by the whoops of pleasure. Cameras clicked and people posed and then the primal instinct of free thinkers took hold and a train of dancers formed around the ball, whooping and wailing ‘Injun’ style! It wasn’t long after this that the first hose came out. The nerves of the committee had begun to crumble. As my friend Simon said on hearing the story “There is only one party in China!” I went straight to turn off the tap…and quashed that first attempt. But it uneased things amongst those that noticed. What a git……we are grown adults here and can get our own way home thank you….but you can go if you like. There followed a flurry of translated messages along those lines between me and him (plus cronies) via a handful of the now very embarrassed and apologetic interpreters. They took great pleasure in repeating my abrupt counters to their superiors. Even so some of our fold had to take the return option, as late night taxis are not always easy. The core artists stayed….the fire raged, cameras snapped and the music flowed. Things got worse when the cronies start to try and douse the fire with fire extinguishers from the other side. I dropped communication at this point, as did a trusty bevy of fellow artists and we went to stand between the Fireball and the extinguishers….in my haste and anger knocking one of them out of their hands to add to the Co2 clouded drama! We made our point pretty clear, and a shocked, short stand off followed. The fire raged on and we won the day. 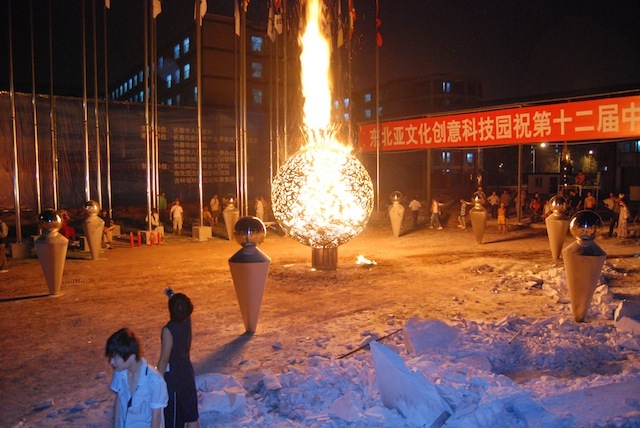 The prefect had to retire, amidst my translated volleys…”This piece is called ‘The Dream of Human Harmony’ and look what you are doing…etc” again explaining that the fire will not damage the piece, which seemed to be their current motivation to out it. They really didn’t get it… One of the choice interpreters took great pleasure in telling her superiors for me that Changchun wants art, but doesn’t seem to understand art and artists! A subject I will get back to. The fire started to mellow now and the authorities had to concede defeat. The ball took on a characteristic glow, illuminated by the coals inside it. The top ring glowed red, the awesome heat kept everyone back and allowed the musicians a time to be heard. The Finish sculptor and my Haitian friend Claude Monte played flute and guitar beautifully. This was the moment I needed to capture it on camera. My dream of getting an aerial shot from the crane went by the wayside in the friction sadly. Another time; but I doubt this ball will ever be burnt again. The evening ended in peace, with profuse apologies and expressions of thanks from the prefect and his boys….even a hug. Sloppy git!